Compare providers of phone and internet bundles in New Zealand at Canstar Blue. Slingshot, Flip, Orcon, Spark, Trustpower and 2degrees were compared on value for money, customer service, network performance, clarity of contract, billing and overall satisfaction. * Overall satisfaction is an individual rating and not a combined total of all ratings. Brands with equal overall satisfaction ratings are listed in alphabetical order. Canstar Blue research finalised in August 2017 and published in September 2017. Slingshot voted top for overall customer satisfaction. Slingshot Broadband offers a bundle of joy? Using a single provider for your broadband, home landline and even mobile phone, is a great option for making the most of discounts and keeping your bills simple. 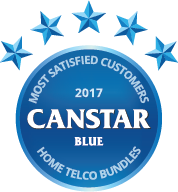 This year, Slingshot has won the Canstar Blue Customer Satisfaction Award 2017. We love to talk! In days of old it was usually face-to-face but today we can communicate anytime, anyplace, anywhere. Calls, texts, email, messaging services, social media, video calls, you name it, we can do it. Having to manage separate internet, phone and mobile accounts can be confusing as well as costly and as a consequence, many people are turning to ‘bundle packages’, relying on a single provider to supply and manage their landline, internet and mobile connections. This results in a single bill that pays for all of your communication needs. In addition, you can enjoy competitive rates and in some cases, prompt payment discounts. If you are looking to sign up to a new provider you may also score yourself a nice giveaway such as a new TV, or streaming device to help you watch some of your favourite shows. Careful, though, these deals often come with a minimum term contract that will lock you in for a pre-agreed period of time. Customer Satisfaction Award winner for 2017, Slingshot was given a maximum five stars in all but one category, customer service, where it scored a respectable four stars. In today’s world of technology based communications, the days of single use devices has been consigned to the history books. For many of us, our TVs, mobiles and computers (and to a much lesser degree, landline connections) are interchangeable with each device fully supporting functions traditionally delivered by the other. The only problem is that they all rely on connectivity and that’s the bit that can cost us a lot of money. An important thing to check when you are looking at any telco package is if your package includes a data cap. This cap is a limit to the amount of data you can use and if you go over it, you’ll probably not lose service but you will pay a lot more for the additional data you use. In our survey 12% of people had been hit with unexpected charges for data use and 14% of people had changed their data cap because they regularly exceeded it. Streaming TV services –Work on approximately 1GB of data for every hour of streaming service viewed. If you’re watching in high definition this will increase to 3GB of data per hour. Streaming music services – Again, a rough guide is around 40MB (0.04GB) an hour. Gaming – This will vary but if a game says it is 3GB, it will use up 3GB of your data to download it. Live Streaming – If you want to broadcast to the world from your front room you need to assume you’ll be using at least 650MB (0.650GB) per hour. Browsing the internet – It really does depend what you are doing but if you use a ball park figure of around 20MB (0.02GB) per hour this should give you a good idea of how much you use. If you haven’t reviewed your phone or internet plan in the past 12 months, then there is a good chance you can find a better deal. If you hadn’t considered the ‘bundle’ approach it might be worth checking out a few providers to see what they offer as it’s definitely not a one-size-fits all approach and you may be surprised at just how tailored you can make your plan. Customer satisfaction winners for 2017, Slingshot offer broadband, landline and mobile plans. Its broadband plans are 12 month fixed contracts and start at $59.95/month for 100GB of VDSL broadband. Bolt-on landline packages start from $5 per month and mobiles from $14. If you want to put all of your eggs in one basket, Slingshot also give you the option of adding power to your bundle too. Do this and they knock 10% off your broadband bills to sweeten the deal. Flip’s open plan broadband deals start at $54.95/month for 100GB and customers can add a landline for and additional $5. Orcon offers broadband, mobile, landline services and power. Broadband starts at $78.99 for a12 month plan on ADSL, VDSL or Fibre and all plans come with unlimited data. You can add on free national landline calls or opt for a more comprehensive landline plans and mobile plans start at $15 per month. Spark provides mobile, landline and broadband services which are loaded with perks that Spark prides itself on. Its bundled communication plans start at $85/month with free calls to national landlines as well as 60GB of ADSL broadband. Mobile plans start from $40 per month and an additional $10 per month discount is available to customers who ‘bundle up’. Trustpower offers electricity and gas services, as well as landline phone and broadband services. Each of these services is offered individually, however customers who ‘bundle’ may have access to discounts and exclusive deals. Prices for Trustpower’s phone and internet bundles begin at $99/month (without multi-policy discounts), which includes 100GB of ADSL or VDSL broadband and 120 minutes of talk. Vodafone offers broadband, mobile and home line services. Its bundle plans start at $85/month which includes 80GB of ADSL broadband and you can add a landline connection for an additional $10. Like other telcos, broadband customers who also have their mobile plan with Vodafone will receive a $10/month discount on broadband. 2degrees offer broadband, home phone and mobile services. Its start with the $75/month plan for 80GB of data and customers can add a home phone line for an additional $15 a month which gives you unlimited calls to NZ and Aussie landlines. Broadband customers who also have a mobile plan with 2degrees will receive an additional $10 off their monthly broadband bill. This should give you an idea on what’s out there but for more details about the plans available in your area, please visit suppliers’ websites. Canstar Blue commissioned I-view to survey 2,500 New Zealand consumers across a range of categories to measure and track customer satisfaction. The outcomes reported are the results from customers who have bundled home telecommunication services and have paid bills (i.e combined mobile/landline/internet) in the last two years – in this case, 1,709 New Zealanders.